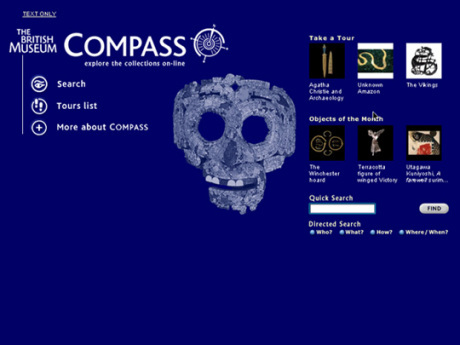 First launched on the web in June 2000 and running until 2007, COMPASS offered a variety of interfaces for exploring the British Museum's collections in new ways, enabling visitors to gain a fuller understanding of objects and their contexts. By providing easy to use but powerful search tools and linking and connecting items from all the museum's collections thematically, COMPASS offered a rich knowledgebase and deeper understanding of the collections. We worked closely with the COMPASS team from the outset supplying the original software architecture for the project and supporting subsequent developments. Our Content Development System enabled the creation and management of all content including a variety of image and multimedia formats and allowed for selected data imports from Merlin, the Museum's collection management system (also delivered by us). The Publishing Pipelines delivered content to all versions of COMPASS on the web and to the specially designed touch-screen consoles in the Reading Room. Featuring around 5000 artefacts chosen by the curators to reflect the extraordinary range of the British Museum's collections, COMPASS offered a number of thematically driven searches with a wealth of links and background information to browse. Each artefact was illustrated with high quality images that could be enlarged and studied in detail. Children's COMPASS, launched in February 2002, included specially designed children's searches and articles written for 7 to 11 year olds, children's tours, activities and quizzes for use in the classroom, noticeboards for children's work, and an 'Ask the Expert' service. Accessibility was a key component of the design for both the web and kiosk systems in the Reading Room culminating in the Visionary Design Award in 2002. National Library for the Blind, Visionary Design Award 2002 - for accessibility to the visually impaired.